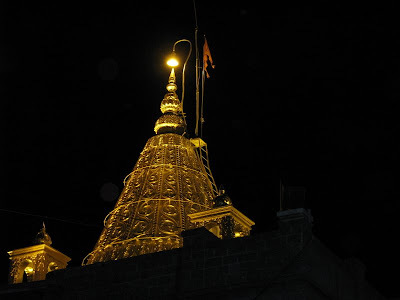 Shirdi is situated in Maharashtra state, India. The nearest airport is Aurangabad ( 126 kms ) but most devotees who travel from abroad reaches Mumbai airport. I write this article to help both the locals and also devotees from abroad to reach Sshirdi safely from Mumbai. For Sai devotees from America, Europe, Malaysia, Singapore, Dubai and other middle east countries, I have tried to give basic information about their journey from Mumbai to Shirdi. The distance between Mumbai to Shirdi is approx 260 kms. Mumbai airport is also the closest international airport to reach Shirdi. So Sai devotees who wish to come to India especially for shirdi darshan can come to Mumbai and then take a bus or taxi to Shirdi. Try to book a flight which reaches India during day time so that its easy for you to get buses to Shirdi as most of buses from Mumbai to Shirdi starts in evening. If you are sure you can check out of the airport before 9 pm Indian Standard Time, then its ok to travel to Dadar by taxi from where you can get Bus to Shirdi. Tell the cabs driver that you wish to reach the place where you can get buses to Shirdi. I don’t have any association with travel agents or taxi or bus. There are few who provide Shirdi Cabs services direct airport pickup, you can choose the car you wish to travel. Search google.com with term "Shirdi cabs". Make sure you are aware of approximate cost, prices are listed below. There are bus to Shirdi which starts even at 11 in night but if you come alone and for women Sai devotees, its not safe. Of course everyone says Saibaba is there to protect. You also have to plan your trip safely. Cabs from Mumbai to Shirdi - 3500 INR to 6000 INR for one way. ( approx 90 $ to 150 $ Must be within 12,000 Rs. for two way if you return within a day. If your flight arrives late night to Mumbai airport or too early in the morning, better stay in a friends house or hotels in Mumbai. There are few near airport. I really don’t have idea about budget Hotels in Mumbai. If your flight arrives early morning 2 am to 4 am, wait at airport for 2 hours and then take taxi to Dadar to take Bus to Shirdi. Theres a cabin inside airport campus itself to book taxi or you can check www.merucabs. com .. For airport to dadar or andheri east pick up. I recommond them as i have experienced their service though a bit expensive. Some buses goes to Nasik and then to shirdi others take a short cut avoiding Nasik. Theres also a Airport in Pune and Aurangabad. You have to check for convinient flight to reach Aurangabad. Shirdi Trains - Its for you to check the Indian railways website if the information below is right. I have only tried to help Sai Baba devotees and cant be responsible if you plan your trip without confirming. A new Railway station has been build in Shirdi called Sai Nagar. Its just 3-4 kms from the Main saibaba temple in Shirdi. I dont have exact idea about and cant give you details about train timings and about how to travel by train to Shirdi if you are new to mumbai and if you came from other countries or states. The best option is to book a travel bus and reach shirdi by bus comfortably. I have provided the train numbers. All you have to do is register in www.irctc.com and check to confirm for seat availability and also timings. Please make it a point not to totally rely on the information provided here and make searches and enquiries from your part to plan the trip. I have just tried to help you with some basic information. Further I have not travelled to Shirdi by train till date. The other nearest railway stations are - Kopargaon - KPG ( 10 miles from shirdi ) & Manmad - 49 kms from Shirdi. You can register in www.irctc.com and from Mumbai CST or Mumbai LTT ( Lokamanya Tilak Kurla ) search for trains to Sai Nagar Shirdi, Manmad and, Kopargaon. For people who travel from other states in India and who come from other countries, please please go by bus from Mumbai to Shirdi. Thats the best option as you might not be used to Mumbai local trains for transit. You can use www.irctc.com, www.yatra.com, www.cleartrip.com. Also www.indianrail.gov.in/index.html and www.trainenquiry.com to check for train seat bookings or availability. Following are the station codes required to be filled in the form of India railway site for seat availability and booking. Reaches after a 10 hour journey next day morning at 10.30 am to Sai Nagar Shirdi station. Arrives at 04:25 am next day early morning. Arrives at 10:23 am to Dadar Mumbai. I always prefer Bus journey from Mumbai to Shirdi and back from Shirdi to Mumbai which takes only 7 to max 9 hours. I went to agra recently i found the train availablity details before my journey on the site www.indiantrains.org.where i got details of the route,fare,seat,ticket availablity etc.It shows me very fastly using that in booked my ticket in Irctc site.If the two sites joined means surely will provide good service to people. May Babaji Bless us all. This post is having a valuable information it's simply great. We have recently added 2 stretch limousines to our fleet of 40 cars. Limo 416 we have but one product to sell, service. he implemented then, are still in force today, 25 years later. Hello one more cab service is missing they also provide cab services in Hyderabad they provide best service for Airport Transfer and Local usage in Hyderabad Airport Cabs Hyderabad and there contact number is 040-22332233 i have used there service and my friends also satisfied with there service.